Nowadays hand tool use has modified; we have planer/thicknessers for flatting boards, hard-point saws for carpentry work and routers to machine mortices. All these changes make us lazy and unskilled to an extent. Hand tools are a means of intervention to complete a job rather than create it in the first place. This is not necessarily a bad thing but if we want to exercise hand skills a key point, so to speak, is achieving good sharp edges on tools. There is no shortage of high quality hand tools if your pockets are deep; I prefer to choose my kit with care and economy. It was while I was busy restoring my No.5 and incidentally my sad looking No.4 smoother as well, that I realised how much I took for granted when sharpening blades. So before we look at other tools in my hand tool kit, this seems like a suitable juncture at which to look at the subject of edge tool sharpening. We now have whole systems for gaining good working edges as technology has moved forward. I tend to view the process of getting a really keen cutting edge as a three-stage process. One is the rather coarse grind if the blade is in poor condition. 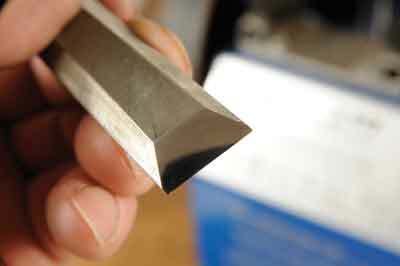 This is generally done at an angle of 25° and needs to be straight across the blade if it is a plane or chisel blade. The second and third stages are to sharpen the ground edge and then refine that edge by honing. This is usually at an angle of 30° and should be done with a honing guide for accuracy. 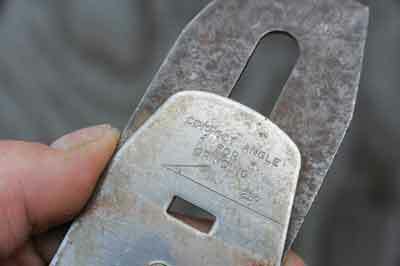 It should be noted that different tools may have slightly different ideal cutting angles. A wet grinder with a fine wheel plus a felt honing wheel and honing compound can carry out the entire sharpening process. However, dry grinders are useful for more serious regrinding work on edge tools. The long standing dry grinder is always useful in the workshop but if used for grinding blades, it needs to be in good condition with a flat surface, you can use a 'devilstone', which is a device with hardened steel wheels, to recondition it, though. A difficulty with a dry grinder is that the abrasive wheels are often too narrow for plane blades and they may give too 'hollow' a grind. Dry grinders can vary in price from cheap to expensive but they should be used with care if you want to get good results. It is very easy to overheat blade edges and cause the steel to 'lose its temper' at which point your only option is full heat treatment. You must have good quality grinding wheels which are normally made from aluminium oxide. Wet grinders such as the famous Tormek brand have larger wheels both in width and diameter than dry grinders, thus being much more suitable for blade grinding and setup and grinding jigs are available to suit the task in hand. Because the wheel runs slowly in a water bath blades cannot become overheated - a much better way to sharpen than the dry grinder type. They tend to be expensive but once bought will serve you well indefinitely. If you are honing a tool then you need the wheel running away from you to avoid the blade catching the soft wheel. I have put these two types together because some stones can be used with oil or water while others may be just suitable with one liquid medium. Don't be tempted to buy a cheap 'market' oilstone as it will only give a rough kind of sharp edge, not a respectable finish. Stones come in natural and synthetic types, the best known natural stone is Arkansas which is available in three grades of hardness but is becoming increasingly rare from over mining. There is a wide variety of synthetic stones that perform equally well and are available in a wide variety of grits. The coarsest start at around 250 grit but the grades go all the way up to 10,000 grit or beyond which is so fine it can only be regarded as a polishing stone. Combination stones with two grit grades bonded back to back are a great way to start decent sharpening. Depending on how fine an edge you want a Japanese 250/1,000 stone or for a really fine edge a 1,000/6,000 grit is better. Norton make a variety of oil and waterstones including tri-form systems which you turn over, to use each face in turn. All these stones can be subject to wear and may need 'dressing' with a special flatting stone to restore them to their original state. A newer development on the market are ceramic stones which use synthetic sapphires bonded into ceramic material. These are incredibly hard and give a polished edge and can be used either dry or with water or oil. 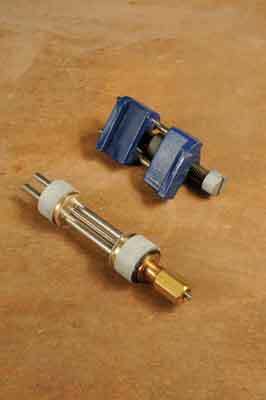 These have become universally popular because they can be bought cheap or expensive. The cheap ones don't have a lot of diamond surface present but are OK if you are on a budget. The better, continuous coated diamond plates are usually quite a lot more expensive but give superior results. They can be used dry but water or, better still, a proper diamond lapping fluid - with low surface tension that allows it to stick to the plate - are better for bench sharpening. The edge from diamond is what I would term 'raw'; it can be lethally sharp but not as silky and polished as say a fine waterstone finish. However, the diamond coated surface does improve with use. This standard material works remarkably well. If you want a good standard cutting edge then wet 'n' dry stuck to a thick piece of float glass will do it. Grades go up to 2,500 grit and it can easily be spray mounted to a flat surface. This alarmist sounding sharpening system from 3M is actually a series of coloured, graded self adhesive sheets which come in a series of very fine particle sizes. They act rather like more traditional honing methods in that they can bring a polish to a blade edge but need to be preceded by a coarser means of sharpening first. The more traditional way to get a really keen, polished edge on a blade after sharpening. It is used with a leather strop or more recently on a felt grinder wheel. You can make strop from cowhide rough side up glued to a piece of wood. 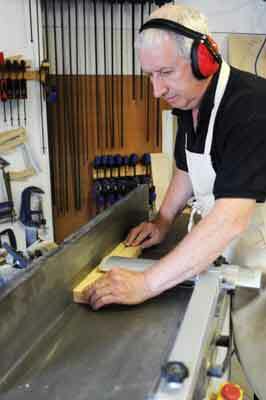 Favoured by woodcarvers as a finishing touch as they want the very best of cutting edges. However, the best strop is in fact MDF cut so the 'end grain' surface is used. It won't curve an edge over like leather and it is consistent in use. Using a strop and honing paste is a really good way to give a polished edge to carving tools and thus make very smooth flowing cuts. The aim of all this sharpening activity is to produce a really keen, lasting crisp edge that will cut accurately with little effort. I own and use various stones and grinders but the Tormek T-7 as a complete sharpening system takes some beating. Its power and cool running waterbath stone means you don't need to worry about overheating blades and Tormek's wide range of jigs, aids and accessories make it a system well worth buying into. There really is nothing to seriously criticise because it works so well. Very different to dry grinding and the risks involved with that. Expensive to buy but you only do it once in a lifetime.